If you have customers who can't get enough of the Australian didgeridoo, this compilation from the excellent Music Mosaic label is the solution. Didgeridoo Drum Dance should fulfill everyone who hungers for the buzzing, barking, and droning sounds of this ancient instrument. If you play this CD in-store, make sure your store's aisles are wide, because the word "dance" in the title is not an idle claim. These sonic explorations of world-beat rhythms and Aboriginal growls will get in the blood of anyone with a pulse. Unlike similar compilations, the only instrumental accompaniment to the didgeridoo is pervasive rhythm played on either percussion, drums, or via programmed beats. This doesn't keep this CD from being a veritable stew of many flavors! Yeah! Didgeridoo Drum Dance made it to the Top 20's for the month of December in the '90FM WWSP's New Age Sampler', category 'Acoustic Resonance / Fantasy Realm'! 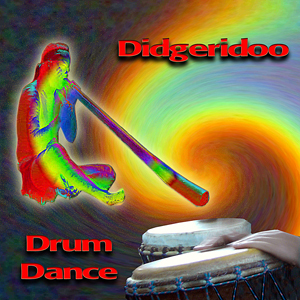 "Rockin' the dancefloor this weekend With 'Didgeridoo Drum Dance"!!" - Comment from DJ Alain E.